Semanta Santa (also widely known as Holy Week) is one of Spain’s largest and most celebrated religious festivals. As Spain is a Catholic country, this time of year certainly does not go unnoticed. This year Holy Week falls on the week of the 13th of April until the 19th. So if you haven’t made plans yet, then why not spend a weekend in Barcelona, Girona or Figueres to witness one of the most important celebrations of the year. Book your train tickets now before they sell out and take advantage of the current prices. If you plan on spending the weekend in Spain, you can take a direct train from Paris to Barcelona, Girona or Figueres, with prices starting at €129.30 in second class. Or, you can also take advantage of the still (be quick, the prices can rise as quickly as the TGV travels) cheap first class prices. Some first class tickets are only €1 more than second class! Here is the current timetable for all direct trains departing from France to Spain. You can always take a connecting train to one of these stations if you are outside of France or in another city. For example, if you are in London, you can take a train to Paris and then take the connecting train to Barcelona. Every year there are hundreds of high-profile processions and celebrations throughout Spain to celebrate Holy Week. Penitential robes (nazareno in Spanish) are commonly worn by participants in the processions. These robes can often be quite striking (pictured above) as they consists of a runic, a hood with a conical tip to conceal the face of the wearer and often a clock. Holy Week is a very important time in the Christian calendar as it marks the end of Lent and commemorates the death and rise of Jesus. Though it can be just as pleasant for non-Christians. Barcelona has fantastic weather during this time of year and the city looks great; it is filled with a celebratory atmosphere and you will find a delicious array of food on offer. Shop windows are full of chocolates, cakes and sugar dough morsels (pestiños). Trying them is must. For more information on Holy Week activities and timetables of processions and masses, just click here. 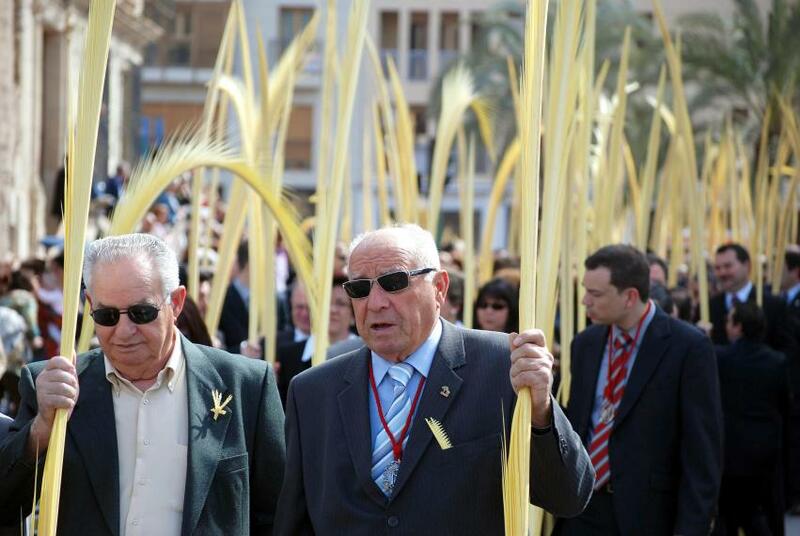 Probably the most significant event in Barcelona during Holy Week is Palm Sunday. A procession takes place in the Ciutat Vella (known as La Burreta) commemorating the arrival of Jesus in Bethlehem. You’ll also find palm stalls throughout the centre of Barcelona selling bleached palm fronds which are carried by the devout in the processions. Another very significant event is the procession of the Virgen de la Macarena, which starts from the Eglésia de Sant Agusti in the Raval quarter. It begins on Good Friday (18th of April) at 17:00. The solemn procession then moves on with some detours to the cathedral in the Barri Gòtic, where it arrives about around 20:00. Shops are not open in Spain on the public holidays of Good Friday and Easter Monday. In the city centre many small tourist souvenir shops are open and some small boutique clothing shops will be open too, but the big shopping centres and high-street brand shops are closed. Restaurants and bars will be open during Easter, as it is a very popular time to spend time with family and celebrate. However, if you aren’t a fan of eating fish, then do be aware than on Good Friday (18th of April) most restaurants will not be serving any red meat due to the Lent tradition. Public transport will also be running, however the services may be reduced and less frequent. Do you have any questions? Just get in touch with us and we will be happy to help.